We begin our look at how the overhead of managing pages impacts SSD performance with iometer. The table below shows iometer random write performance; there are two rows for each drive, one for “new” performance after a secure erase and one for “used” performance after the drive has been well used. 4KB Random Write Speed New "Used"
Note that the “used” performance should be the slowest you’ll ever see the drive get. In theory, all of the pages are filled with some sort of data at this point. All of the drives, with the exception of the JMicron based SSDs went down in performance in the “used” state. And the only reason the JMicron drive didn’t get any slower was because it is already bottlenecked elsewhere; you can’t get much slower than 0.03MB/s in this test. 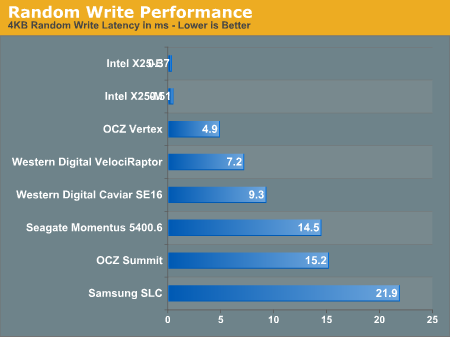 These are pretty serious performance drops; the OCZ Vertex runs at nearly 1/4 the speed after it’s been used and Intel’s X25-M can only crunch through about 60% the IOs per second that it did when brand new. So are SSDs doomed? Is performance going to tank over time and make these things worthless? "Used" SSD performance vs. conventional hard drives. Pay close attention to the average write latency in the graph above. While Intel’s X25-M pulls an extremely fast sub-0.3ms write latency normally, it levels off at 0.51ms in its used mode. The OCZ Vertex manages a 1.43ms new and 4.86ms used. There’s additional overhead for every write but a well designed SSD will still manage extremely low write latencies. To put things in perspective, look at these drives at their worst compared to Western Digital’s VelociRaptor.The degraded performance X25-M still completes write requests in around 1/8 the time of the VelociRaptor. Transfer speeds are still 8x higher as well. Note that not all SSDs see their performance drop gracefully. The two Samsung based drives perform more like hard drives here, but I'll explain that tradeoff much later in this article. How does this all translate into real world performance? I ran PCMark Vantage on the new and used Intel drive to see how performance changed. The real world performance hit varies from 0 - 14% depending on the drive. While the drives are still faster than a regular hard drive, performance does drop in the real world by a noticeable amount. The trim command would keep the drive’s performance closer to its peak for longer, but it would not have prevented this from happening. HDD specific tests show much more severe drops, ranging from 20 - 40% depending on the drive. Despite the performance drop, these drives are still much faster than even the fastest hard drives.